Our friends joined us on a hot Friday evening to taste the first batch of 6 random Santa Cruz Mountains Pinots under $30. Gusts of wind helped cool things down and added a tinge of excitement: Falling grapefruit. Everyone would cringe when a gust came and a few grapefruit would fall, but none of them landed anywhere near us. In the past three years of entertaining under the giant grapefruit tree only Parker has been hit by a falling grapefruit, right on the noggin. The wind calmed down as the evening cooled. I tried to keep the loud political discussions out of the neighbors windows by asking everyone to avoid the topic. While this didn't exactly put an end to these discussions or the surrounding bets, I don't think the neighbors heard any of it. Instead we serenaded them with Kenny Roger's Lucille and The Gambler. The lyrics to Lucille are still endlessly repeating through my head. I wonder which they would have preferred. We started off with some nice whites. When everyone arrived I poured the first wine and we tasted. A - 2010 Dancing Creek Winery, Santa Cruz Mountains, Legato came in first place with an average of 3.30. F - 2012 Radonich Brothers Vineyards, Estate came in second place with an average of 2.91. E - 2012 McHenry Vineyard, Estate Santa Cruz Mountains came in third place with an average of 2.82. 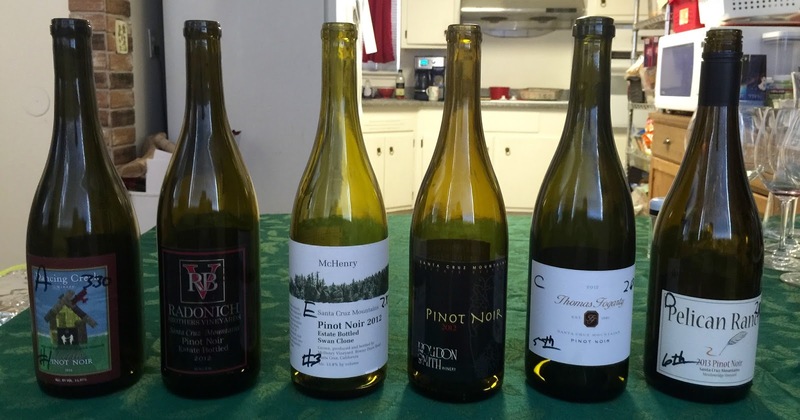 B - 2012 Roudon-Smith Winery, Santa Cruz Mountains Private Reserve came in fourth place with an average of 2.73. C - 2012 Thomas Fogarty Winery & Vineyards, Santa Cruz Mountains came in fifth place with an average of 2.68. D - 2011 Pelican Ranch Winery, Santa Cruz Mts., Meadowridge Vineyard came in last place with an average of 2.36.